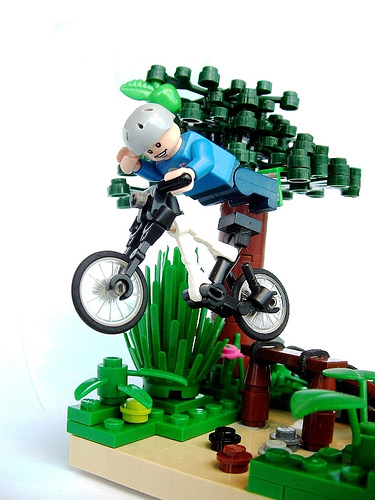 In his latest LEGO creation, Piotr Ślęzak depicts an exciting ride! That bike is really nice and the posing of the rider is top-notch. Nice job! Took me a moment to realize the bike wasn’t the pre-fabricated model. It’s awesome… and it’s able to make sweet jumps! I’m increasingly impressed by builders who can do excellent greenery like this. It’s crafstmanship to arrange plastic so organically. Whoops sorry. Didn’t mean to leave that earlier comment. WOW! What is the part under the seat? rubber pneumatic tubing. Also where the crankshaft would be and maybe a little around the handlebars. Kinda cheating for a purist but.. who cares?